Posted in challenge, Manicures, Nail Art, pictures, Week of Love Challenge	by Jessica W.
Good morning all! The last day of the challenge! 🙂 Today’s skittlelette nail art is inspired by the clothing worn by both Ke$ha and Pitbull in the video for “Timber”. For my thumb and pinky I’ve used 2 thin coats of Orly Star of Bombay. On my ring and pointer fingers I’ve used 3 thin coats of Orly Peaceful Opposition, laid down striping vinyls, and painted Orly Passion Fruit on top, quickly pulling up the striping vinyls. 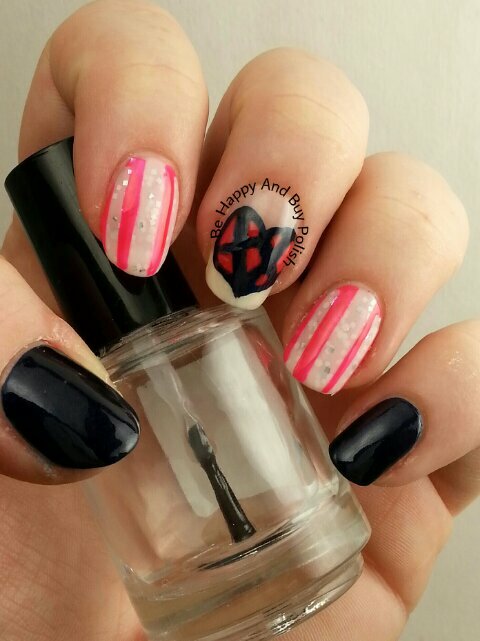 On my middle finger, I used Orly Star of Bombay to create the heart, then filled in the spaces with Passion Fruit. What do you think of this look? I love that it’s a bit edgy and fun! What are your favorites that I’ve done from this week: candy hearts, kisses, roses, hearts, or today’s? Ooh… very edgy! Do like! Great nail art design! Different from all the red/pinks I’ve been seeing today too 🙂 Happy Valentine’s Day! I love this! That heart is awesome!! Haha that’s why I like the song too. I know you’ve had a heavy week so no worries!